The annual meeting of qualified proprietors will take place on 28 June 2016 at 2.30pm in the Lovat Arms Hotel, Beauly. This will be immediately followed by a meeting of the Board. Both meetings are open to the public. Please see the Notices and Publications sections of this website for more details. A former bridge apron, identified as a potential barrier to fish passage, has been eased as a consequence of works carried out by Ness & Beauly Fisheries Trust in conjunction with SEPA. Removal of this barrier should enable fish to access a far greater length of this burn for spawning. 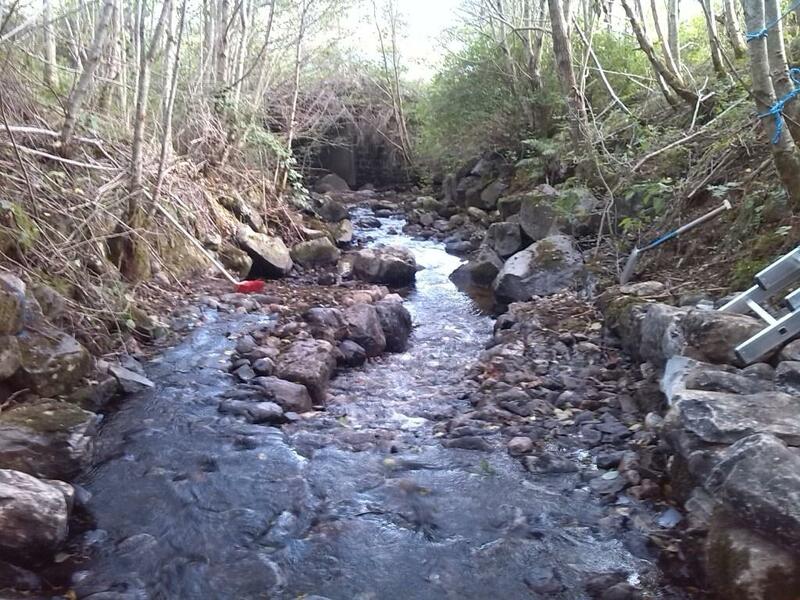 A photo of the burn following the works is shown below. The Beauly District Fishery Board has approved the Beauly Cathment Fisheries Management Plan prepared in conjunction with Ness & Beauly Fisheries Trust. The Plan will run from 2014 to 2020 and covers proposed actions to tackle amongst other things predation, non-native species, barriers to migration illegal fishing and riparian habitat improvement. The full plan can be viewed on the Publications page of this website. For the first time in over 60 years no salmon were taken by netsmen in the Inverness Firth during the 2013 season – and a new agreement has been reached to extend a key salmon conservation measure for a further year. The Beauly District Salmon Fishery Board, working in partnership with the Ness District Fishery Board, has reached agreement with two key net and cobble operators to close their stations for the entire 2014 season through to May 2015. Chris Conroy, Director of the Ness & Beauly Fisheries Trust, said: ”The total number of salmon reported by nets in our area in 2012 was 542. This number was reduced to zero in 2013 as a result of a landmark salmon conservation agreement. “This is the first time in at least 61 years that no fish were recorded by our net fishery, making this a major milestone in salmon conservation and a real boost for the Ness and Beauly systems. “Being able to extend this agreement for a further year is excellent news for all with an interest in wild salmon populations and is pivotal to our strategy for reversing the decline of the Ness population. The main focus of the Board’s attention on barrier removal in 2013 has been the barrier on the Culburnie burn. Discussions continue with SEPA staff with a view to speedy removal as part of the overall RAFTS/SEPA project, however progress is slow. SEPA and NBFT will now draw up plans with an associated timescale and further details should be available shortly. In 2013 the Ness & Beauly Fisheries Trust (NBFT) continued its work on non-native species in the Beauly District Fishery Board catchment. The treatment of Japanese Knotweed on the Bridgend Burn, Beauly appears to have been largely successful and follow up treatments will be undertaken, assuming landowner permission, in 2014. A survey was undertaken within the catchment during the summer to facilitate mapping of the extent of the non-native plant issue on the Beauly catchment. This also resulted in a small area of Himalayan balsam being removed by the contractor. The data will be assessed and a strategy for control/removal of key species developed.